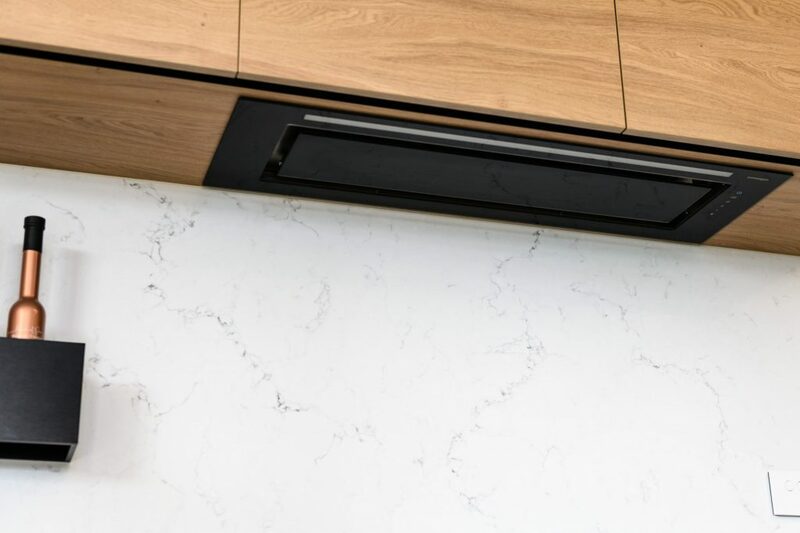 The clients of this kitchen joinery project have a passion for cooking and a priority was for a highly functional kitchen with a contemporary, tailored finish. This heritage home and contemporary kitchen contrast yet work together to stunning effect. 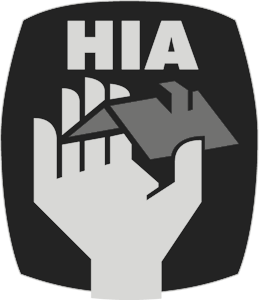 The clients engaged an interior designer to design the layout and select the finishes. The interior designer then worked closely with a KAM design consultant to ensure the vision was implemented to the highest standard. The kitchen layout achieves the brief of being highly functional, with importance given to access to corners within the cabinetry, height of appliances and ample storage. Vertical board holders, slide out spice racks, tea towel rail, inner pantry drawers and under sink accessories add to the functionality requirements of the kitchen. 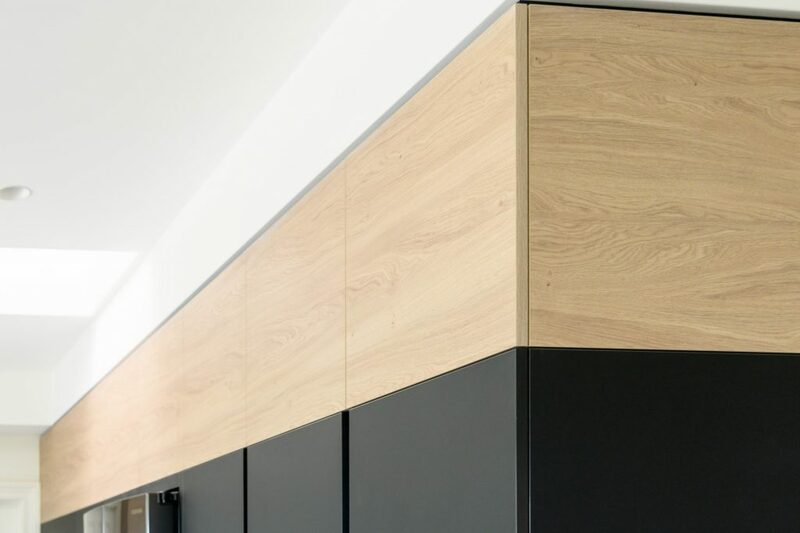 For the joinery panels, Fenix was selected for its high-tech qualities including durability, ease of maintenance and removal of micoscratches, as well as minimising fingerprints. 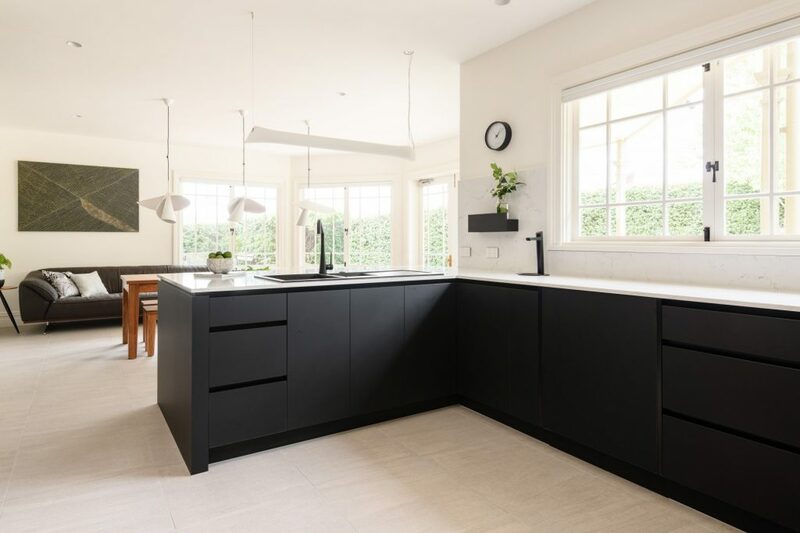 In nano matte black, the panels contrast perfectly with the warmth of engineered timber used on the overhead cupboards, and engineered stone bench tops and splashback to create contemporary luxe style. 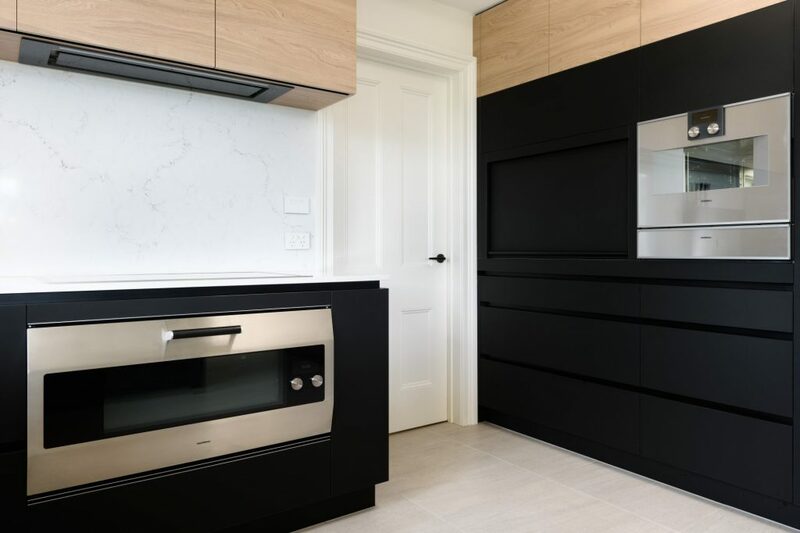 Adding to the tailored finish of this kitchen is that the white melamine in the interior cupboards has been edged in black and the shadow line between the cabinetry and ceiling has also been highlighted in black. In addition, cabinet doors cover end panels, where possible, rather than the end panels sitting alongside the doors. It’s this attention to detail that makes customised joinery stand out. We admire KAM for their willingness to tackle challenging briefs in such a friendly manner. Their joinery and meticulous attention to detail is remarkable. The engineered timber overhead cabinets were expertly crafted from several sheets of material cut to grain match and appears as a continuous horizontal grain. They are perfectly aligned, with minimal door spacing, to accentuate the linear style required by the interior designer. When standing next to the tall cupboards looking along the engineered timber cabinetry, the door spacing is barely visible. 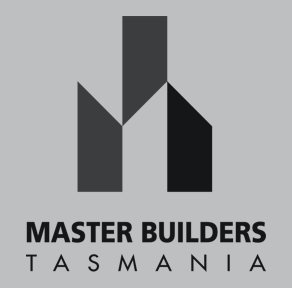 In addition, the varying sizes of the vertical shadow lines of the tall cupboards and the door spacing lines of the overhead cupboards have been manufactured and installed with absolute precision, again achieving a truly customised finish. 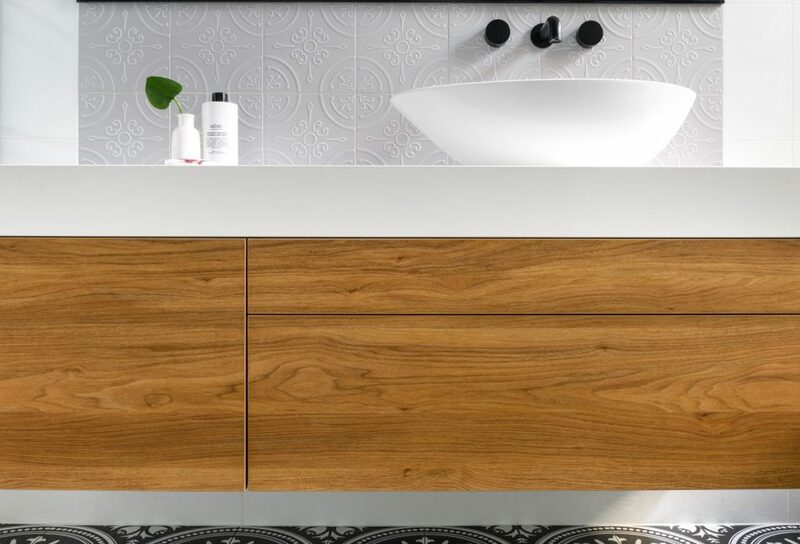 The engineered timber extends both under and around the overhead cupboards providing a high-end tailored finish. 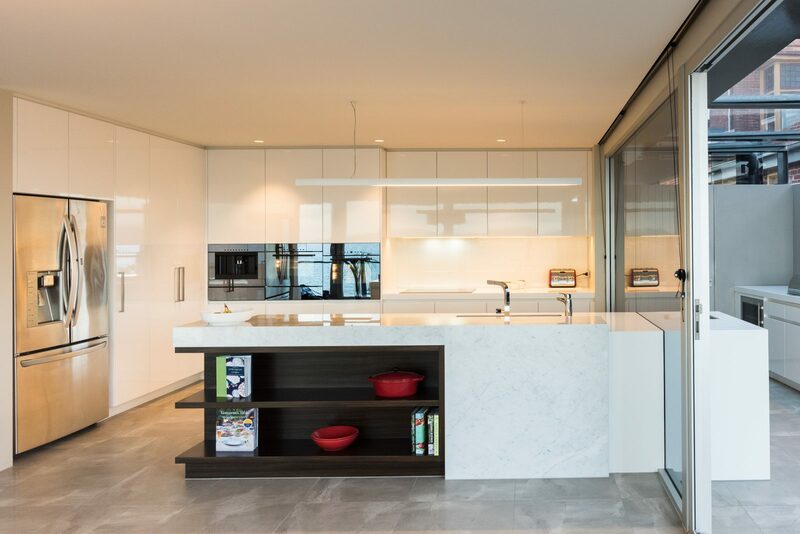 Attention was given to the joinery around the fridge to minimise the space between the joinery and fridge and complements the repeated use of shadow lines throughout the cabinetry. A custom made vanity provided the interior designer with the opportunity to specify the appropriate size and style.